Amongst the busyness of Waterloo, the doors into the The Green Elephant provide an oasis for families. It’s friendly foyer is perfectly set up for an easy sign-in and drop-off of your children. The centre’s dining room provides a cafe feel, which gives children an independence for eating, and participating in cooking activities with a skilled and experienced chef. Classrooms are thoughtfully presented to engage children in learning, playing and building positive relationships. The spacious classrooms are a surprise to find in such a location and allow for year-round fun, no matter the Sydney weather. The selection of quality and innovative resources are a true accomplishment of the centres, and allows children to stretch their own imaginations of what they can use to play, create and learn. The outdoor space is skirted by individual class patios which look onto a green yard that beckons children to play. Designed as an outdoor classroom, children will learn about composting, gardening, sustainability and the environment, all while developing their fine and gross motor skills. 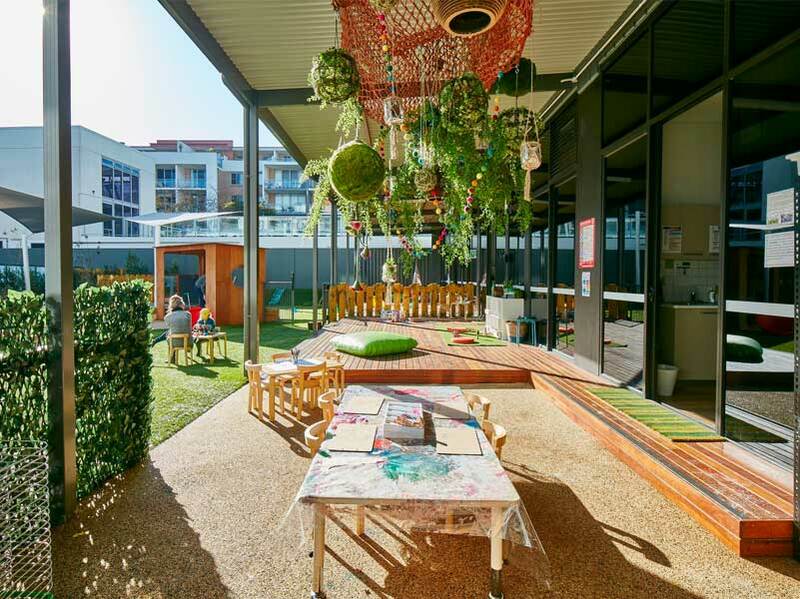 A modern sandpit and adventure retreat in a bustling city centre, The green elephant at Waterloo is a place where families can only be impressed by.